For the first time scientists have shown how lack of genetic diversity in a threatened bird species could limit its ability to adapt to future challenges. Latest research on the New Zealand hihi, or stitchbird, highlights the struggles most threatened species globally might face to adapt to threats such as climate change or emerging diseases. 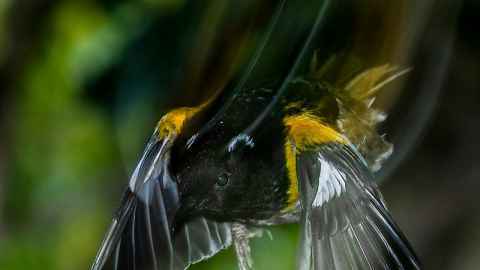 A team of scientists led by University of Auckland’s Dr Anna Santure used painstakingly-collected data on hihi from the Department of Conservation and the Zoological Society of London from the past 20 years to produce one of the most detailed genetic profiles of any threatened bird anywhere in the world. Genetic diversity is a key issue for bird populations which have suffered severe population loss. Hihi on Te-Hauturu-o-Toi (Little Barrier Island) were isolated for more than a century after European settlement decimated the population but decades of conservation management has seen numbers rise to somewhere between 600-6000 birds, leading to new populations being established on other wildlife sanctuaries including a growing population on nearby Tiritiri Matangi Island. New genomic techniques used for the latest research has found that among hihi, genetic diversity was five times lower than for any species the researchers could find comparable data for including both threatened species and healthy populations. “For the first time ever we have been able to show that incredibly low genetic diversity in a threatened bird population very strongly aligns to their inability to adapt to changes in their environment so that climate change could potentially impact them very negatively,” says Dr Santure. The research team included Dr Pierre de Villemereuil from the Centre for Functional and Evolutionary Ecology in Montpellier, France, Dr Alexis Rutschmann and Ms Kate Lee from the University of Auckland’s School of Biological Sciences, and Dr John Ewen and the co-lead author Dr Patricia Brekke from the Institute of Zoology, Zoological Society of London. The study, supported by the Marsden Fund, is published in Current Biology.